Dr. Ashok Rajgopal is an exceptionally prolific surgeon in India. The top knee replacement surgeon in India has to his credit around 10,000 arthroscopic and over 3,200 total knee arthro-plastic surgeries. 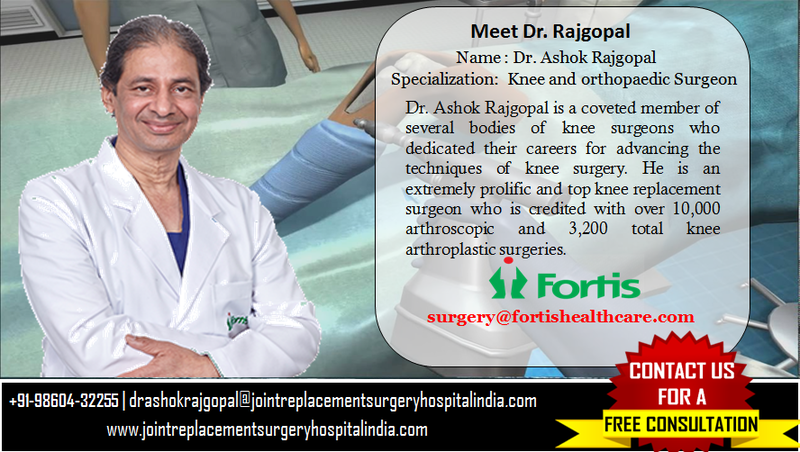 Being a coveted member of several bodies of the knee surgeons, he has dedicated his career to advance the techniques in the knee replacement surgery in India. Joint Replacement Surgery Hospital India acts as a bridge between the overseas patients seeking their knee replacement surgery with Dr. Rajgopal in India. Knee replacement surgery is recommend for patients with severely damaged knees by arthritis or any form of injury that restricts them to perform the simplest activities such as walking or climbing up the stairs. Often surgery is considered when the non surgical methods fail to yield the desired results. The surgeon perform the knee replacement surgery in India which relieves the pain, correct the deformity and help you resume your day to day activities. The knee replacement surgery in India is a safe and effective procedure performed by highly skilled and qualified surgeon. Dr. Rajgopal is the first orthopaedic surgeon in India to perform the virtual total knee replacement surgery using the patient specific instruments. The knee replacement surgeon at Medanta- the Medicity Hospital in Delhi, Gurgaon is also the member of an elite body of the international knee replacement surgeons who are involved in designing the new knee implants. The latest knee implant “PERSONA” was launched in September, 2013 in India. This has virtually revolutionized the concept of the knee surgery by creating an almost personalized system of the surgery at Medanta- the Medicity. To get Dr. Ashok Rajgopal appointment call at +91-9860432255 or submit your query to drashokrajgopal@jointreplacementsurgeryhospitalindia.com. We will get back to you with all the necessary information within 24 hours. • Assists our overseas patients with their medical visa letters, travel and stay arrangements, etc. • Provide other quick services such as foreign exchange facility, planning your vacation tour to a scenic place post surgery, etc. Joint Replacement Surgery Hospital India is a leading medical service provider in India assisting the global patients to schedule their appointment with the top knee surgeon in India. Our association with the highly skilled, qualified surgeons with a vast experience to perform the knee replacement procedures at the hospitals provides good outcome. The network of hospitals located at different cities across the country is highly equipped with the latest technology and instruments to provide safe and effective outcome. Contact us on our website www.jointreplacementsurgeryhospitalindia.com for more information about the knee replacement surgery with top knee surgeon in India.